When Maura Kistler first came to the Gorge, she knew she had found her place. A former teacher and co-owner of Waterstone Outdoors, she’s been major players in the rock climbing community in the Gorge for over 28 years. Here are Maura’s top picks for how to play in the Gorge like a climber. To book a guided climbing trip, check out our local New River Gorge rock climbing outfitters. Need gear? Head to Waterstone Outdoors. This climbing shop will get you outfitted for all your Gorge adventures. A good day always features a great meal – and Wood Iron is one of the best places to fuel up before or refuel after a great day of adventuring. Stretch out after a day at the crag with a yoga session at New River Yoga. One of the most popular climbing spots in the New River Gorge is also one of the most scenic. These vast sandstone cliffs provide nearly 3 miles of climbing routes and breathtaking views. 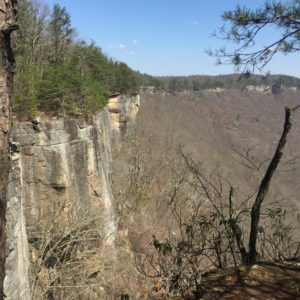 Climb this sandstone tower for a panoramic view of the Gorge – including the New River Gorge Bridge. This new protected piece of land in Oak Hill features large rocks that are perfect for bouldering – a type of climbing where you don’t need ropes or a harness.